Author(s): Dongmei Bao, Xiaobao Jin, Yan Ma, Jiayong Zhu. Guangdong Provincial Key Laboratory of Pharmaceutical Bioactive Substances, Guangdong Pharmaceutical University, Guangzhou, People's Republic of China. A missense mutation of Aspartic to Asparagine acid in 113 position of liver-targeting peptide CSP I-plus modified rEndostatin (rES-CSP) happened unexpectedly results in the changes of protein secondary structure and a reduced bioactivity. With the aim to clarify the structure-function relationships featuring the fuse protein rES-CSP, the three-dimensional structural models of wild-type and mutant D113NrES-CSP were constructed by template-based modeling approach. To evaluate the effect of the single mutation on rES-CSP stability, the molecular dynamic simulation was used to reveal the structural and dynamic characteristics. Analysis on the bioactivity were conducted using a number of validated in vitro assays including proliferation, migration, cell cycle and apoptosis in HepG2 cells. Results showed that the mutant rES-CSP reduce the stability and loss of function, and the wild-type rES-CSP could both bind to the normal liver cells Chang's and the hepatoma cells HepG2 but significantly higher than non-targeted rEndostatin. rESCSP could inhibit the proliferation of hepatoma cells in a dose–dependent manner, and increase the proportion of G1 phase, reduce the proportion of S phase, promote the apoptosis on hepatoma cells. These results make a further complement of the mechanisms by which the fuse protein rES-CSP would provide a feasible and convenient approach to produce liver-targeting drugs for treatment of the liver disease. Keywords: Biological activity, hepatocellular carcinoma, human endostatin, liver-targeting peptide, missense mutation, molecular dynamic simulation. Affiliation:Guangdong Provincial Key Laboratory of Pharmaceutical Bioactive Substances, Guangdong Pharmaceutical University, Guangzhou, People's Republic of China. Keywords:Biological activity, hepatocellular carcinoma, human endostatin, liver-targeting peptide, missense mutation, molecular dynamic simulation. Abstract:A missense mutation of Aspartic to Asparagine acid in 113 position of liver-targeting peptide CSP I-plus modified rEndostatin (rES-CSP) happened unexpectedly results in the changes of protein secondary structure and a reduced bioactivity. 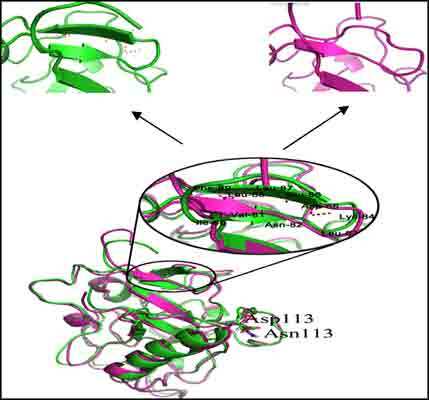 With the aim to clarify the structure-function relationships featuring the fuse protein rES-CSP, the three-dimensional structural models of wild-type and mutant D113NrES-CSP were constructed by template-based modeling approach. To evaluate the effect of the single mutation on rES-CSP stability, the molecular dynamic simulation was used to reveal the structural and dynamic characteristics. Analysis on the bioactivity were conducted using a number of validated in vitro assays including proliferation, migration, cell cycle and apoptosis in HepG2 cells. Results showed that the mutant rES-CSP reduce the stability and loss of function, and the wild-type rES-CSP could both bind to the normal liver cells Chang's and the hepatoma cells HepG2 but significantly higher than non-targeted rEndostatin. rESCSP could inhibit the proliferation of hepatoma cells in a dose–dependent manner, and increase the proportion of G1 phase, reduce the proportion of S phase, promote the apoptosis on hepatoma cells. These results make a further complement of the mechanisms by which the fuse protein rES-CSP would provide a feasible and convenient approach to produce liver-targeting drugs for treatment of the liver disease.